Ski touring gives access to the mountains when they are at their most glorious. In the right conditions the sport is fun and exhilarating. More than any other winter mountain activity, ski touring requires particular conditions to be at their very best. There are only a limited number of days with good quality snow and fine weather. An element of luck and preparation are required for the perfect ski tour. The Trailmaps Ski Touring Series of maps and guides are useful aides for planning, preparing and executing that perfect day out. Map 1 covers the area around Glenmore and Meail a’Bhuachaille and describes a tour from Glenmore to Bynack More. 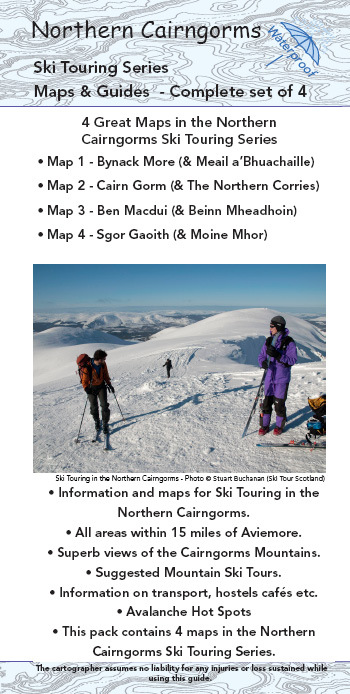 Map 2 describes the Northern Corries of Cairn Gorm with routes from the ski resort car parks. 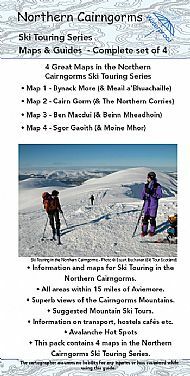 Map 3 describes the quintessential Scottish Ski Tour to Ben Macdui and a 2nd tour deep into the Cairngorms to Beinn Mheadhoin. Map 4 covers some of the vast upland plateau at Moine Mhor (The Great Moss) and describes two separate tours from Glen Feshie to Sgor Gaoith.